All our security railing posts and rails are 38mm diameter, chrome plated and can be assembled into a number of different configurations. 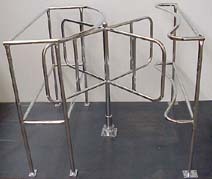 We also manufacture two styles of turnstile, which are also chrome plated. Details of these products and notes on their use are listed in this section. NOTE: Security railing and turnstiles in particular are to regulate traffic flow and children should not be left unattended near them or injury could occur. Our standard turnstile mechanism is a heavy duty cam type which means that it is silent in operation and also does not have the back movement inherent in ratchet types. It is secured to the turnstile column using 4 high tensile bolts which are concealed by a chrome plated cover for appearance and security. The direction of rotation can be reversed. If at any time this is required, please ring for information. Due to a shortage of space in supermarkets, it is often difficult to provide an emergency fire exit. Although most stores have a turnstile to let customers into the sales area, by their design, they prevent them getting out, and so in an emergency can become a trap. To overcome this problem we are now manufacturing a device which can be installed into the column of our turnstile above the standard one-way mechanism. This is done by cutting a section out of the column, drilling and bolting it in place. 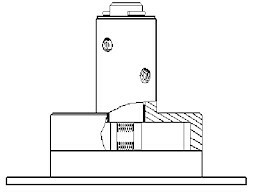 When overloaded, it will release and allow the upper part of the column to rotate. The unit is built so that the tension setting can be varied to allow for different installations. Since the Release Mechanism has been designed for emergency use, it is constructed so that it will be noisy when forced backwards to ensure that staff are aware of any abuse to the equipment. WARNING: This apparatus is designed to operate when overloaded in an emergency situation and although the parts are hardened and can withstand some wear, regular use will damage the pins making the locking operation less effective. This is the standard turnstile for customer entry. The wrap around frame ensures that the entrance is always secure. Overall dimensions are approximately: 1200x1200x1000mm high. It incorporates our standard silent mechanism as is used on the larger trolley turnstile which appears elsewhere in the brochure. Because of its relatively small size, this frame is manufactured in 25mm round tube but has a 38mm diameter centre column.